Although the scale and number of manufacturers has dwindled significantly since the peak production of the 1950’s, Northamptonshire still enjoys a significant local footwear industry that includes a unique cluster of some of the finest international heritage brands. Brands such as Trickers, Crockett and Jones, Barker, Cheaney, Grenson, Loake, John Lobb, Edward Green, Alfred Sargeant and Churchs have been in operation since the 19th century, all of which enjoying an enviable reputation for the production of high quality bespoke gentlemen’s ‘brogues’ among other models, and are the footwear of choice for members of the Royal Family and successive Prime Ministers. These vintage brands are supplemented today by contemporary gentlemen’s fashion brands such as Jeffrey West and emerging footwear brands such as Gaziano and Girling and Stamp Shoes. Perhaps the most famous international brand still to be made in Northamptonshire is that of Dr Martens who still manufacture their vintage Made in England brand of DM boots in the original Griggs factory in Cobbs Lane, Wollaston. Wollaston is also home to NPS Shoes which was founded as a cooperative in 1881. Other notable local footwear manufacturers include George Cox , pioneer of the original ‘creeper’, equestrian boot makers Horace Batten and Sanders & Sanders, wide-fitting shoe manufacturers Padders and DB Shoes, children’s footwear manufacturer Daisy Roots, and Juju creators of the original British Jelly Shoe who have been manufacturing iconic shoes and children’s wellington boots in their own factory for over 25 years. 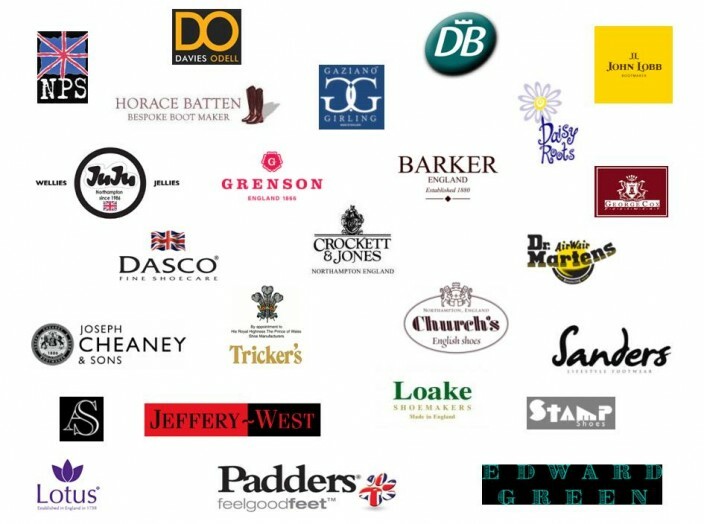 In addition to footwear manufacturers, the county is also home to specialist shoe repair and heel manufacturers Davies Odell, and Dunkelman and Son – manufacturer of the respected Dasco shoe care and footwear accessory brand. This page was added on 28/03/2013.